At NCTE, I gave a presentation about short-form writing (Twitter, social updating, etc. ), and one of the projects I showed was a video that my son had created which was one second long and was posted on Youtube, and how many hits it had gotten. I’ve written about this site once before, but I shared it with my students as part of a larger discussion about remixing content, and (ironically enough), about stereotypes that they were discovering of Americans and Muslims as we are finishing up our critical look at Three Cups of Tea. 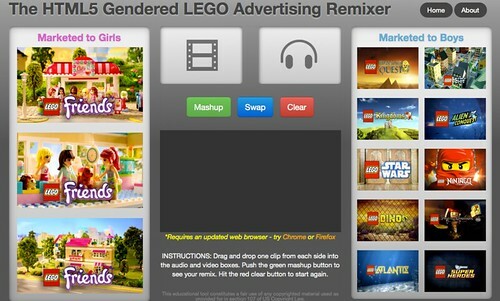 The way I brought those two discussions together — along with a foray into companies targeting young kids with advertising — is with the HTML5 Gendered Lego Advertising Remixer. If you have not shared this with your students, you should. It’s a great, and entertaining, way to show how audio, visual and the selling of a product to a girl or boy (as opposed to any gender kid) is done. The site allows you to mix the audio tracks from one Lego commercial targeted towards one gender with the video from the other. So you get the soundtrack to the Star Wars Lego set mixed with the video of the Lego Friends video. You should have heard the hoots of laughter from my room. But it was serious, too, as we held a discussion about why pink is always girls, why explosions are always boys, and what happens to the kids who fall in-between those two worlds (which is mostly everyone). It was a pretty amazing discussion, and all thanks to the remixing effects of this one site. Here is a word cloud of the names that my students came up with for their versions of “hacked chess.” The names alone are pretty cool to think about. But you should have heard all the thinking that went into the 15 minutes of planning they had to do to recreate the game of chess, with assorted extra pieces. 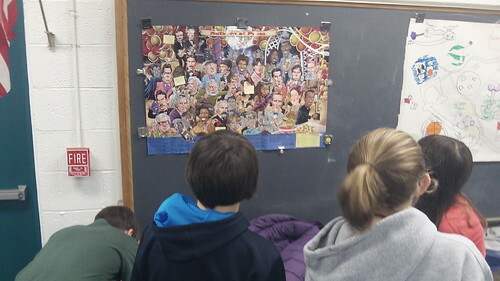 Pretty amazing collaborative thinking. Yesterday, I shared out how we were doing some work to understand the culture of hacking and remixing. 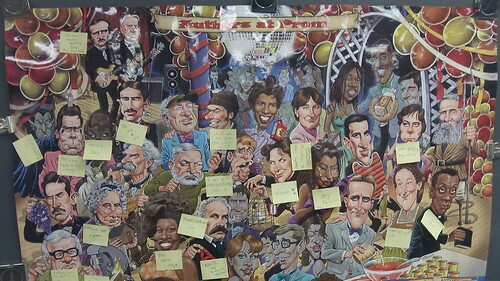 I stole an idea from a session at NCTE in which we were sent around the hotel, hacking the framed images on the wall of famous singers and performers with funny (and we think) witty sayings, using sticky notes. That Hackjam activity — by Andrea Zellner and Chad Sansing – stayed with me as something fun and instructive about the hacking mentality, and I decided I needed to try it with my students. So, yesterday morning, as part of their morning work, I gave them each a sticky note and pointed them to a funny poster I have on the back of the wall. 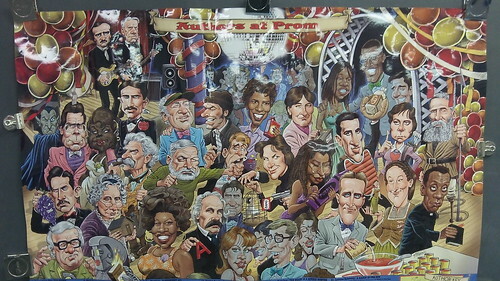 It’s full of iconic writers “at the prom” and it pokes fun at them through the visual — they are depicted as cartoonish characters and they look like they were posing for one of those sidewalk artists you see in amusement parks — and puns galore. 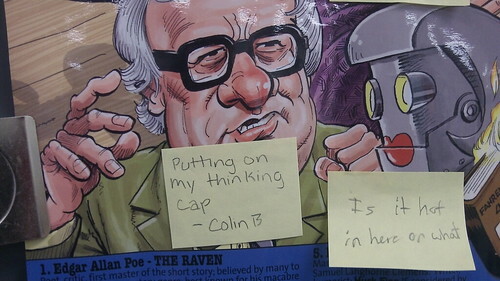 Most of my students don’t get the inside jokes, but the hacking activity gave them an inroad. Their instructions? 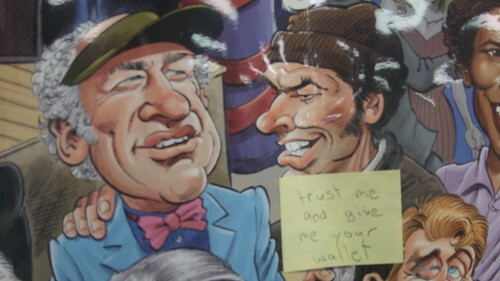 Make fun of the writers by adding snarky comments to the poster. Oh, boy. 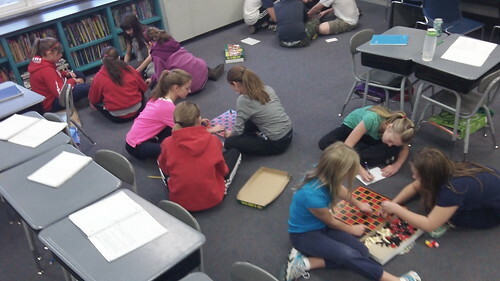 They had a blast with the activity, and I could barely peel them away from the hacking to get the school day underway. I didn’t mind. In fact, that’s what I hoped might happen, and it allowed me yet another avenue to talk about hacking as something beyond the negative of coverage in the news (without downplaying the damage that can be caused) and into the positive of creative energy that comes from re-imagining a piece of art a something new. Give it a try. Your students, and you, will have a blast. And unlike NCTE, where some employee of the hotel followed us around and tore down our poster hacks not long after we finished, these hacks can stay up there for nice long while, and maybe a few more will get added as inspiration hits. You never know. 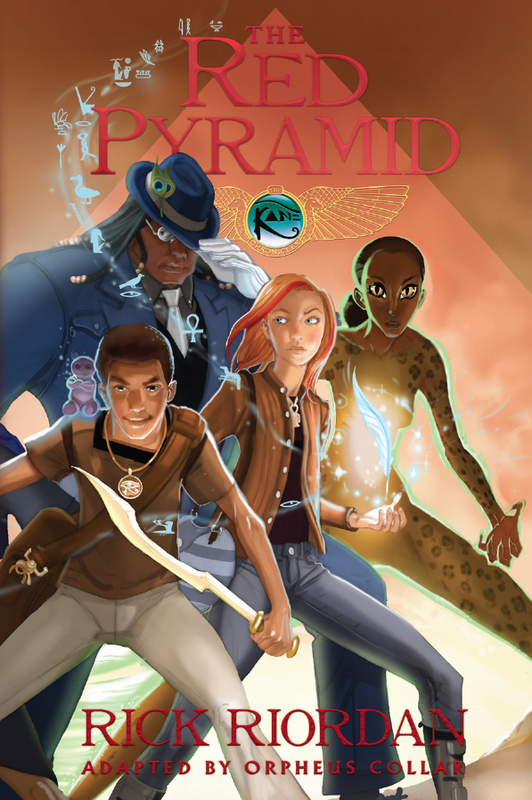 It’s been some time since my youngest son and I read The Red Pyramid by the ever-prolific Rick Riordan, but the latest graphic novelization of the first book in the Kane Chronicles stories brought it all back to both of us. “This is a pretty good,” my son said, after spending about an hour reading through it. 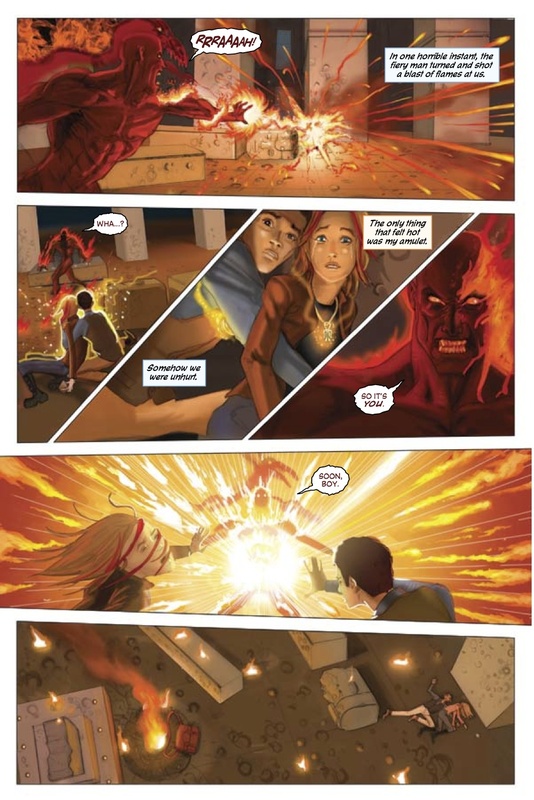 The Red Pyramid graphic novel does some wonderful things with imagery as the two Kane children (Carter and Sadie) discover their history and their magical potential within the Egyptian culture (Riordan seems determined to use all the main ancient religions as backdrops for adventure stories). The pictures are colorful and vibrant and full of action (I suspect this is what elicited the comment from my 8 year old son). The use of dark and light canvasses are pretty interesting to view. The problem is that the novel part of the graphic novel moniker is overplayed. There’s too much text. Or so it seems to me. It feels like they were determined to jam as much of the novel into the graphic version (and I realize if they had done the reverse, I would have been complaining that they ruined the story that way. Such is the role of a critic). The text is so dense that I wonder if any kids will actually read the book, or if they will just look at the pictures. My older sons did just that — glanced through the book and then put it down. They had no interest in the story. What makes this story particularly difficult, I think, is that the novel is narrated alternatively by Carter and then by Sadie, and then back and forth. Here, although they tried to use color in text boxes to signify the narrator, it is very confusing to follow. I do like the idea of the graphic novel complemented the novel, though, and I think this graphic novelization is done better than the one of The Lightning Thief. I’ll be adding it to my classroom collection, and keep an eye on who takes it out, and whether they read it or just skim through the pages. And maybe it doesn’t matter. Maybe this version of the story gets kids interested in the Kane Chronicles series, and that keeps them reading. Which is what I want. What comes to mind when you hear the word “hacker” and is it a good or bad connotation? What is remixing and is it good or bad to do it? 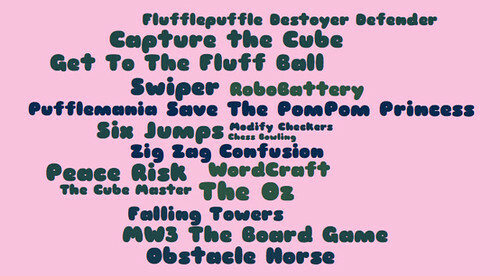 Have you ever used cheat codes in a game? These three questions opened up a slew of discussions for my students. I did a little informal polling about perceptions of hacking, and of my 80 students, only four did not raise their hands when I asked if they think “hacking is a bad thing.” Most of their impressions of the term come from news reports of groups hacking into systems to steal personal information, or the stereotyped geek sitting at his (it seemed to be only a male hacker in their minds) trying to break into a bank or country’s database or something. The way I steered the discussion in this early stage is to talk about hacking as a way of taking something that is designed one way, and reworking it for your own needs or advantage. I gave an example of working on a lawn mower. A part breaks, you don’t have what the repair manual says you need to repair it, so you “hack” a fix with materials you have to make the engine work. That simple analogy seemed to open some eyes about what we were talking about. Our discussions around remixing was fascinating as well because many of them did not know the term. We’re going to do an activity today around remixing with Lego commercials, and their use of gender stereotypes. And the last stretch of the conversation, about the validity of cheat codes with video games, was the liveliest. Who know I had so many cheaters in the room? Ha. Actually, what we talked about is the shift in players sharing information with larger communities and how cheat code websites and video tutorials are now an accepted and expected part of a gaming community. The no-tech activity we did involved hacking. I broke students down into small groups and handed each one a chess set, with an extra bag of assorted odd parts: a dice, some tiny little letter cubes, pompom balls, and other things I found in my basement. 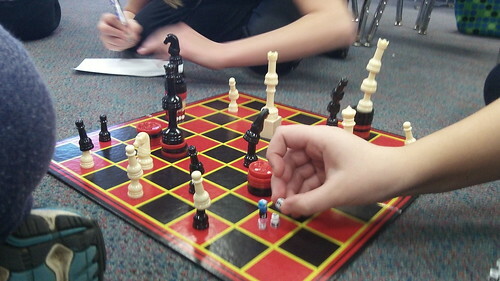 Their task: To hack the game of chess and remix it into an entirely new board game. They could use any or all of the pieces they had. Each group had 15 minutes to come up with the name of their game, the objective for winning or finishing the game, and the basic rules. My classroom was a hive of activity and collaboration, and mostly, I just stood back and watched them learning together — not just about hacking, but also about working together, expository writing and creative engineering of a system. They will be sharing out some of the game ideas today in class, as a sort of “elevator pitch” — as if they were trying to sell the game to a company. It’s hard not to like a story with (self-professed) simple stick drawings of stray dogs trying to steal some hamburgers, told from the viewpoint of one of the dogs. Stick Dog by Tom Watson won’t go down in the annals of high literature, but it is a fun and engaging story for elementary students who have finished up the Diary of a Wimpy Kid collection and are looking for a fix. Yeah, Stick Dog is another in the same vein of Jeff Kinney’s genre of first person narrative told with comic doodles. They seem to everywhere, right? I imagine this book would be enjoyed by kids who have dogs, or wish they had dogs, and wonder what they are thinking as they eye the dinner table for scraps. Watson has done an admirable job of bringing us inside the head of his main character, even if it is a little square (OK, so a little criticism … sorry). Here is a video of the Mass Ed Talk I gave over the summer for the Massachusetts Teachers Association. The main idea here is encouraging students to shift from users of media to producers of content through the design and publication of video games. PS — you can view some of the other Mass Ed Talks in this playlist, too. One way we talk about informational text is through a creative writing project called Imaginary Peaceful Lands. Students read and analyze text structure of travel brochures, and then create their own, built around the themes of an imaginary place and elements of peace. Of all the projects, this is often the one that they say they had the most fun with at the end of the year reflection. These are two videos showing an inside look at some of the maps they created.